Solemnity celebrated on the first of November. 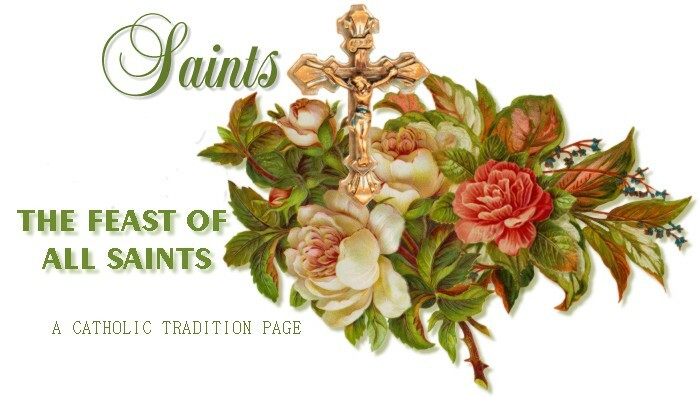 It is instituted to honour all the saints, known and unknown, and, according to Urban IV, to supply any deficiencies in the faithful's celebration of saints' feasts during the year. In the early days the Christians were accustomed to solemnize the anniversary of a martyr's death for Christ at the place of martyrdom. In the fourth century, neighbouring dioceses began to interchange feasts, to transfer relics, to divide them, and to join in a commonfeast; as is shown by the invitation of St. Basil of Caesarea (397) to the bishops of the province of Pontus. Frequently groups of martyrssuffered on the same day, which naturally led to a joint commemoration. In the persecution of Diocletian the number of martyrs became so great that a separate day could not be assigned to each. But the Church, feeling that every martyr should be venerated, appointed a common day for all. The first trace of this we find in Antioch on the Sunday after Pentecost. We also find mention of a common day in a sermon of St. Ephrem the Syrian (373), and in the 74th homily of St. John Chrysostom (407). At first only martyrs and St. John the Baptist were honoured by a special day. Other saints were added gradually, and increased in number when a regular process ofcanonization was established; still, as early as 411 there is in the Chaldean Calendar a "Commemoratio Confessorum" for the Friday afterEaster. In the West Boniface IV, 13 May, 609, or 610, consecrated the Pantheon in Rome to the Blessed Virgin and all the martyrs, ordering an anniversary. Gregory III (731-741) consecrated a chapel in the Basilica of St. Peter to all the saints and fixed the anniversary for 1 November. A basilica of the Apostles already existed in Rome, and its dedication was annually remembered on 1 May. Gregory IV(827-844) extended the celebration on 1 November to the entire Church. The vigil seems to have been held as early as the feast itself. The octave was added by Sixtus IV (1471-84).